The new "Etsy Studio" may not be much of a boost for indie authors but other aspects of the 2017 roll-out will be. A new Shop Manager and new search facilities are being lined up, for example, as well as improved inventory management and new options for consumers to buy and, crucially, make payment. 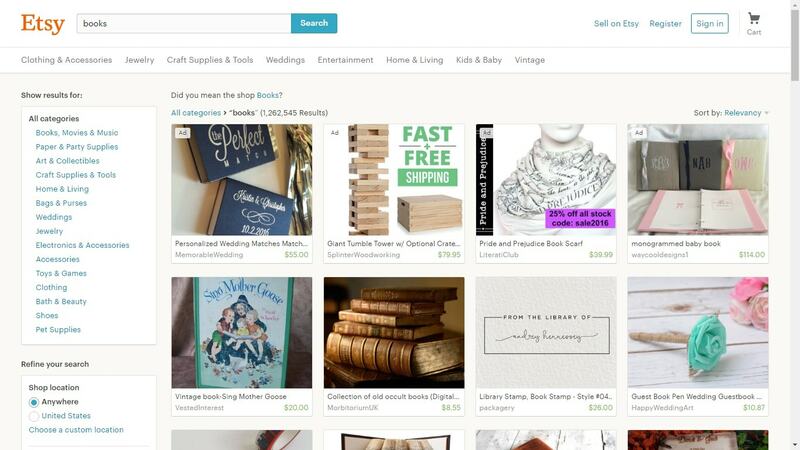 Etsy is a great way for authors to connect with new consumers and sell our books and ebooks and even audiobooks. Yep, we can sell digital downloads on Etsy, along with our print books and perhaps best of all trinkets and accessories to compliment our titles and boost discovery. Etsy is a much over-looked gem in the retail sector, where consumers are not looking for the cheapest so much as for the different. This is the place to sell signed editions, special editions, accessories like mugs, t-shirts and whatever else we can think of. And premium prices are almost a given. Etsy has global reach and the chance to set up a trickle income quite independent from the big retailers we tend to lazily rely on (and then whine about when the going gets tough). When so many of us are building substantial mailing lits it's almost criminal not to be sending some of that traffic to sites that offer us seriously good "royalties". Etsy may not have the customer base of Amazon, but 24 million Etsy shoppers buying from 1.6 million sellers is not to be sneezed at. Nor is the 3.5% commission they take. Etsy, Shopify, Selz and a host of other alternatives to the big retailers offer is ways to engage meaningfully with consumers and up-sell products that our regular buyers on Amazon and co. will never be aware of. No.we'll never get the volume sales that Amazon can bring if we are lucky enough to get into that league, but for indies just ticking over with sales, alternative routes to consumers like Etsy, Selz, Shopify, etc, offer ways to bring in extra revenue and possibly set up a viable small business in its own right for a friend or family member to manage. I didn’t read this closely so may have missed the part where he mentioned “You pay to list your product on Etsy.” So while it all sounds nice and good, you do have to be willing to price your books such that they might actually sell and you have to maintain the fees for keeping them there. Having tried ebay where listing is free for various trinkets (embroidered dish towels, logo dish towels and signed editions) I’d say that you’ll be lucky to sell one or two per year. Non-fiction may sell better than fiction given Etsy’s typical listing. There are neat items on Etsy–usually quite expensive.